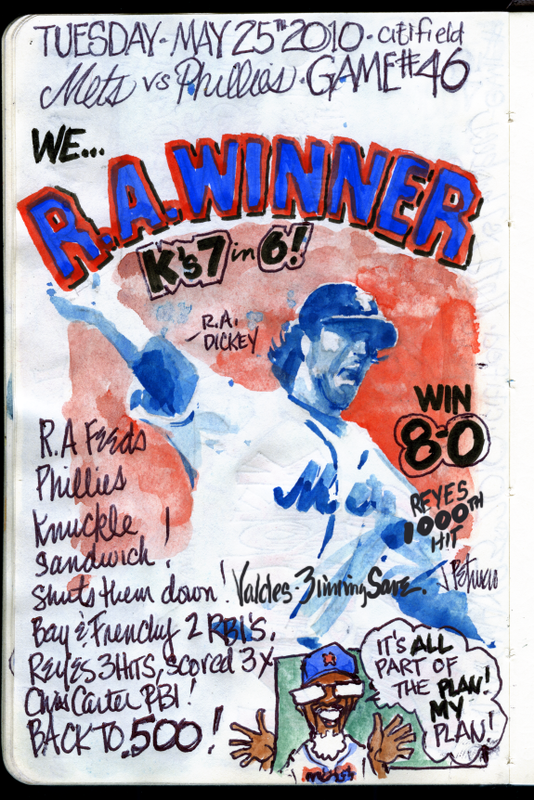 My Mets Journal: Phils a bunch of Knuckleheads! I'm going to miss Jerry if only because of how well you caricature him. i was looking forward to seeing what u'd do with Dickey since he looks like a cartoon character already - & luv the more impressionist look!...I don't know how u can be so right-on with your sketches & so funny at he same time! A real talent! Glad your a Mets fan & started this blog! The humor helps so much when things look grim...like a Steve Somers intro but in color! Keep it up & THANKS! it's awesome! I believe you nailed it Jes. Joe's sketches provoke the same feelings as listening to a Steve Somers Opening Monologue. no love for valdes' 3 inning save? those are pretty rare these days. otherwise love the sketches! p.s will this be available as a book when your finished?